Though I was raised in rural Indiana, I remember hunting for paw-paws only once in my life. I was very young and my sketchy memory of the event consists of hunting in the woods in early autumn with my mother and siblings for something that looked like small, rotten bananas. What are paw-paws, you might ask? The Asimina triloba aka paw-paw, Indiana banana, custard apple, or poor man’s banana is a fruit that grows wild on trees which are found mainly along wooded streams in the Appalachian region. Since the paw-paw is indigenous to 26 states from the Gulf Coast up to the Great Lakes, I’m not quite sure why it is most often associated with Indiana, though I did find one “Kentucky banana” reference and one “West Virginia banana” reference. Maybe folks in the other 25 states have better sense than to tromp around in the woods in September looking for something that resembles rotten bananas. Or, more likely, an early Hoosier was the first to attach a state moniker to the paw-paw and it stuck. Those musings aside, paw-paws are said to be quite tasty as well as rich in nutritional value; packed with tons of protein, antioxidants, vitamins A and C, as well as several minerals. So why is the paw-paw not better known? Several things could account for that, not the least being a bad image. 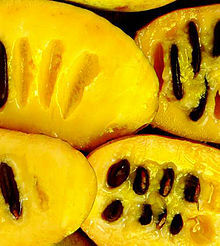 Its odd bean-like shape and mottled skin that blackens as it ripens doesn’t look as appetizing as a bright yellow banana or a shiny red apple. 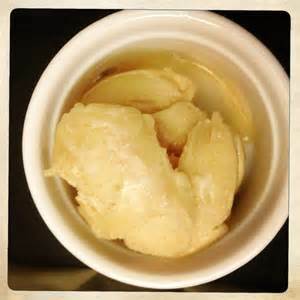 But if one can get past the fruit’s appearance, the soft orange custard-like flesh is tasty and sweet. 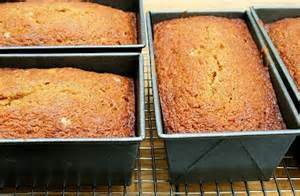 That the fruit has such short shelf-life; two or three days at room temperature doesn’t help its popularity, though it will last a week in refrigeration and the pulp can be frozen for later use. 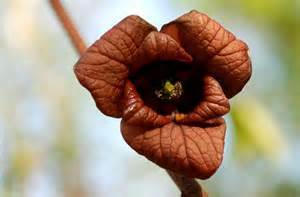 Another strike against the paw-paw is the blossoms’ unpleasant scent, which smells like rotting meat and tends to discourage bees and other insects from pollinating it, making the paw-paw somewhat scarce. 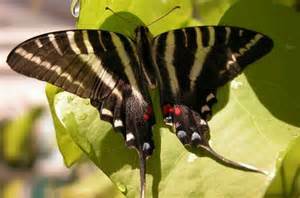 One insect that does love the tree is the zebra swallowtail butterfly; its larvae feed on the leaves. 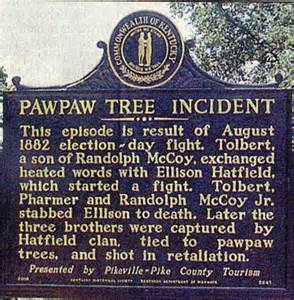 Another black mark on the paw-paw tree is an incident that happened during the infamous feud between the Hatfield and McCoy families of Kentucky and West Virginia. Three of the McCoy boys got into an argument with Ellison Hatfield and killed him. 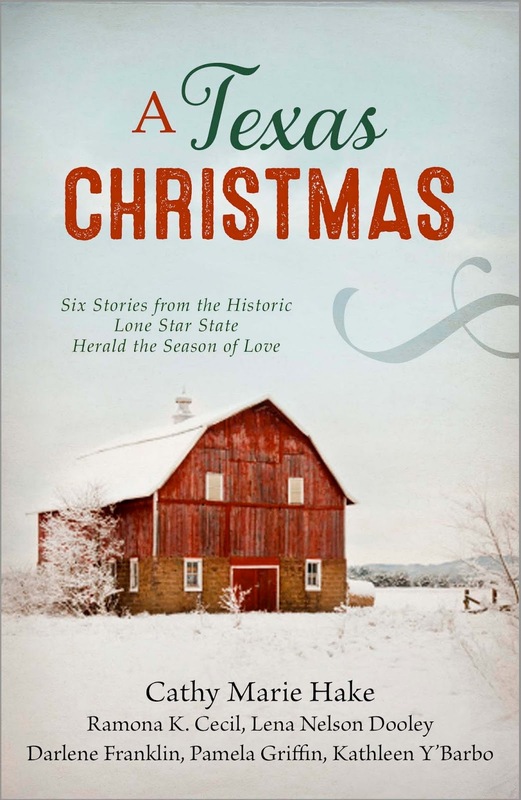 In retaliation, the Hatfield clan tied the three McCoy boys to a paw-paw tree and shot them. “Where, oh where is pretty little Susie? I found several recipes that feature paw-paws including recipes for pies, custards, cookies, cakes and quick breads. Do I plan to traipse around in the woods this September and hunt for paw-paws? I doubt it. However, if I happen on some at a farmer’s market, I just might be tempted to give them a try. Do you have a memory or family story about paw-paws? I’d love to hear it! Thank you, Ramona, for your interesting post about paw paw's. 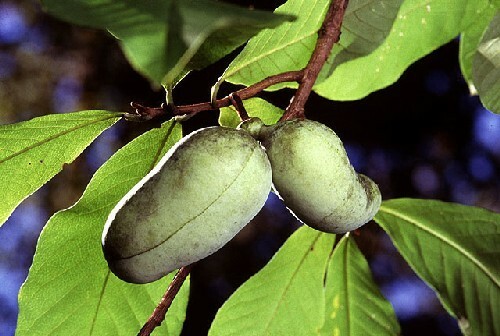 I didn't know a thing about them but had heard that song from way back and did't know what a paw paw was. Now I do, thanks to you! Hi, Melanie! Glad you enjoyed the post. I learned several things myself while researching this topic. I'd never heard of them before, but the outside reminds me a little of milkweed, which I loved finding near a canal as a child. Oh my, I remember singing that song in elementary school. We even did a little dance with it for a school program one time. It was one of our fun play-ground songs. 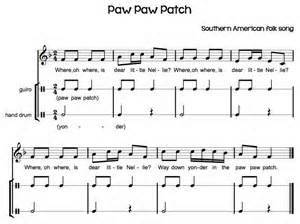 I had no idea what a paw paw was, but I liked singing the song. This is the first time I've ever read about they are and how they are used. Wish I had known back then...70 years ago. I'm thinking I'm a disgrace to my grandpa who loved to identify trees because we might have pawpaws growing at our old house, and I didn't even realize it! I'll be checking. And I think I remember that song and another one about paw-paws.